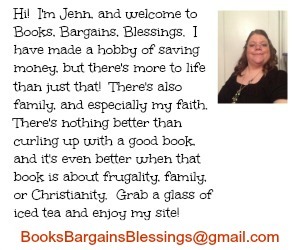 Books, Bargains, Blessings: My birthday. A friend posted on my Facebook wall "Quit havin' myself, but Happy Birthday". He and I are the same age. It's funny how thirty years ago birthdays were something to look forward to and I'd count down the days. Now I don't exactly enjoy the extra number added to my age, but the birthday freebies are kind of fun. Last week I received a number of birthday coupons in my e-mail. I started using a few of them, and then this week the big day. Mom said she'd take me somewhere to eat, so I picked Chili's. I asked if they still did free dessert and was told I would get a free scoop of ice cream. What was NOT told to me is they sing to you with your free ice cream. I stopped at McDonalds just before 7 to try the new pineapple mango smoothie. (I loved it, but wouldn't pay full price for it. It was on sale for 25 cents yesterday.) There was such a run on smoothies, I was late to church and as I walked in the back of the room, my pastor whispered "Happy Birthday" and then another friend called out "Happy Birthday". After church, I was joking with a friend and told her she should take me to Denny's for my birthday since they give you a free Grand Slam (and also thinking that they don't sing to you at Denny's). She got all excited that it was my birthday and said we'd go and asked if we could invite a few others. Well people started inquiring about my age. The oldest anyone guessed was 26. (Have I ever mentioned I LOVE my friends? Ha ha!) I admitted my age, which is the same age as some of their parents, and got looks like "You can't be serious". I was surprised how few knew I was as old as I am! Well, my friend rounded up 18 of my closest friends to go to Denny's. I even had someone treat me to my drink (which isn't free) and pay the tip for me. While I was there, a friend from Kansas called. She has remembered my birthday every year since we met 15 years ago, and has called every time except the summer she was in Russia and I was in China. :) She even called me from Costa Rica one year. Of course, I didn't really have time to chat but told her we'd talk soon. When I returned to the table, this is what happened. . .
Then I came home and needed to talk to a friend at some stuff, so that rounded out my day. What a wonderful day.